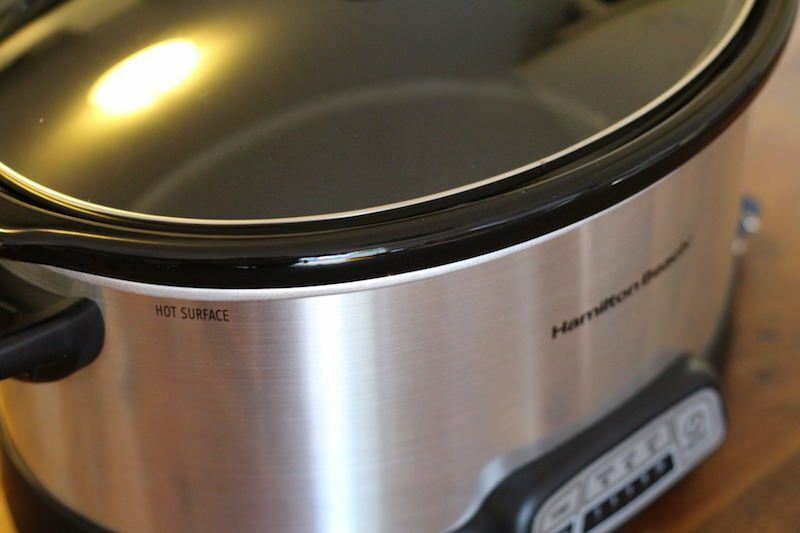 This is a surprisingly cheap slow cooker from the reliable and trusted brand Hamilton Beach. 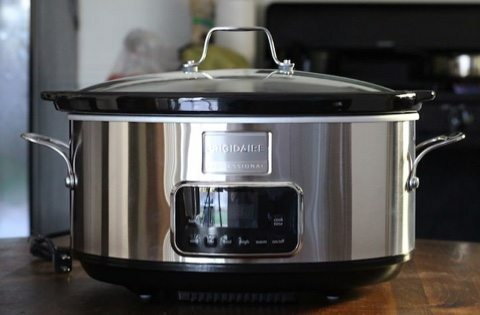 A great alternative to Crock Pot, this slow cooker has all the basic makings of a fantastic appliance, plus a programmable timer. With a 10-hour max cook time and automatic warming, you can certainly make some large meals, including roasts (4lb) and chicken (6lb) in this guy! Slow cooking is a perfect cooking method for the holiday season. With everyone so busy, it's easy to save yourself a bit of time by tossing some ingredients into the crock and setting it to cook for 6-10 hours. Hey, you can even cook while you sleep! And stews, soups, or large roasts are perfect comfort foods to warm you up during the cold weather. Even if you're reading this during the summer, keep in mind that a BBQ pot luck is much more fun when there's chili or baked beans! 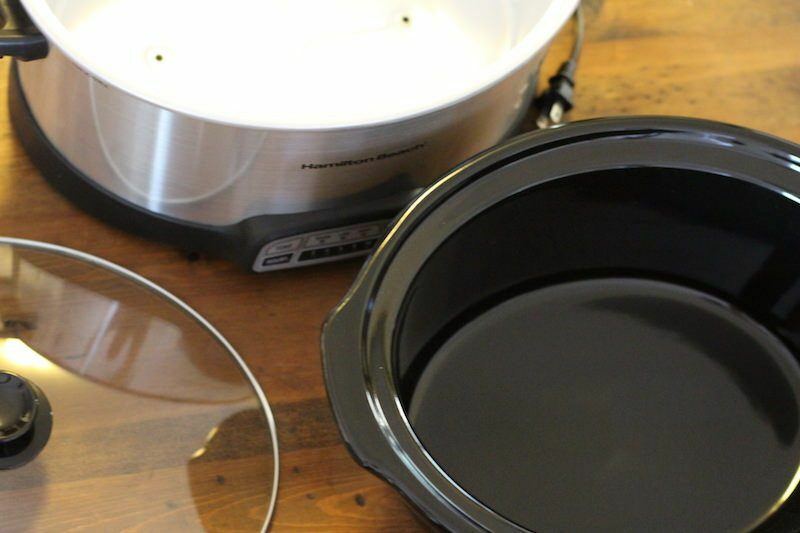 Hamilton Beach has been making appliances for decades, and they have a very robust and diverse lineup of slow cookers. The sizes of these slow cookers range from a tiny 2-quarter, to an extra large 8-quarter. Within this size range they have a variety of features to consider. 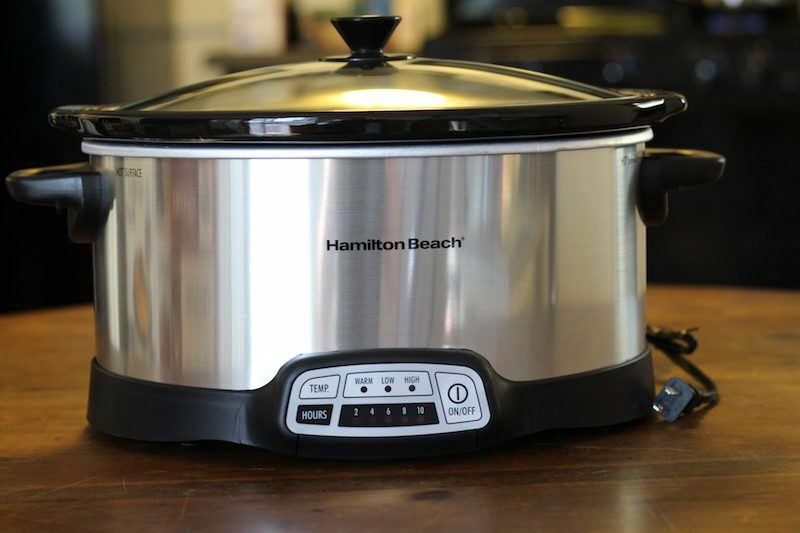 Today, we're going to review the Hamilton Beach Model 33473 7-Quart Programmable Slow Cooker in Silver. The standard size for a cooker is about 5-6 quarts, so this particular model is more on the large size, but it's not the biggest available. 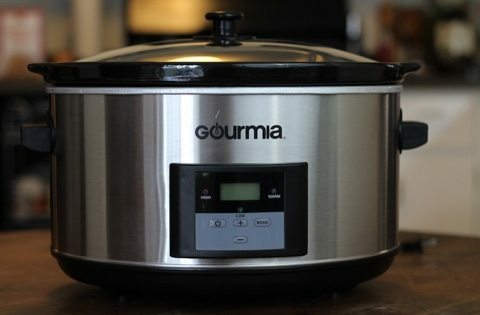 Let's take a look at some of the specific features, what meal I cooked with it, and how it compares with other similar slow cookers available online. 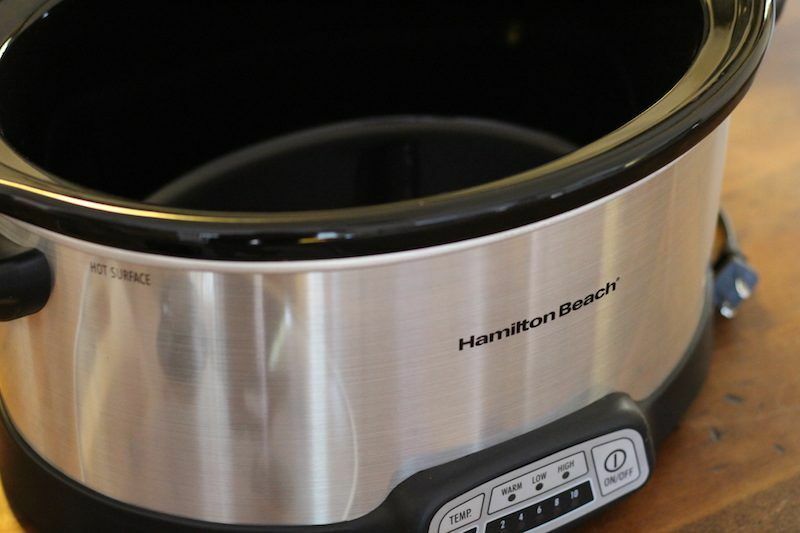 Much of what you get with this Hamilton Beach slow cooker is pretty standard. It comes with a large, black, removable crock. This crock is dishwasher safe, as well as oven safe (but not safe for the stovetop…it will crack). The lid is dishwasher safe as well. This model is not part of the Stay or Go series of cookers, so it does not come with locking clips for the lid or a rubber seal around the edge. Actually I prefer this type of lid because the rubber seals need to be replaced from time to time. Slow cookers tend to last for a long time, so a lack of rubber seal makes this model even more indestructible and low-maintenance! You also get cool-touch handles so you won't burn yourself and rubber feat to prevent sliding; all very basic stuff, but it's worth mentioning so you know you aren't missing anything important. This size of slow cooker is lacking in design options though, and is only available in silver. Design is secondary to function in my opinion though, so I'm not that worried about having a funky teal wave [LINK] design lol. Though the Hamilton Beach model 33473 does not have a ton of extra features, it is programmable! Looking at the price, you might be surprised to find out it has this feature though, as some manual slow cookers cost more. 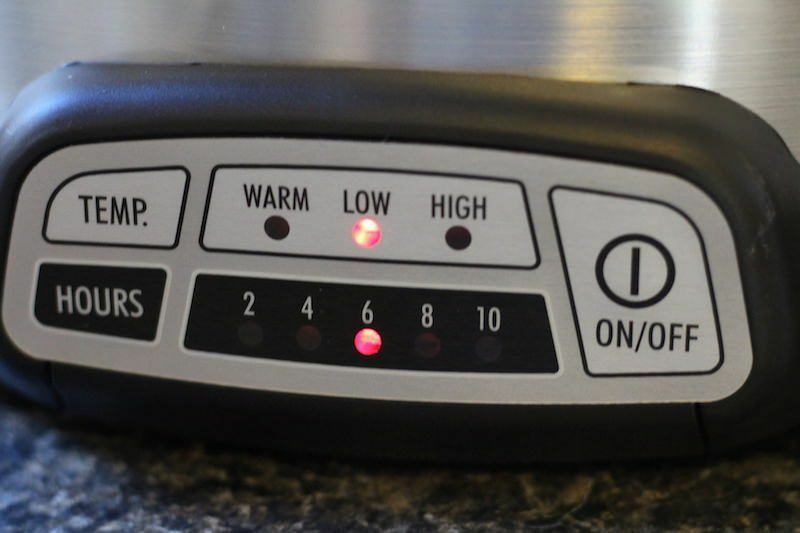 I can't say what goes into the pricing of each model, but I do know that having the ability to set a specific amount of time for the meal to cook then automatically set to warm is very important to me! 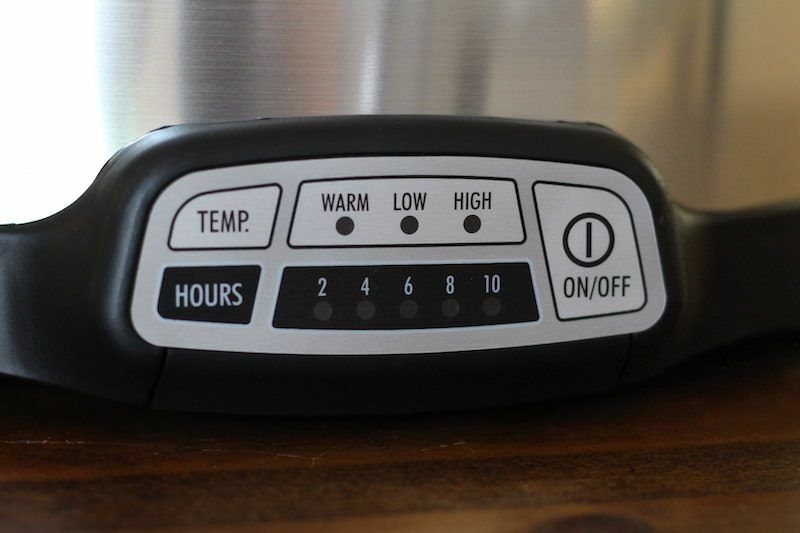 One extra thing that you don't see on most models though is the ability to program a 10-hour cook time. I think this is because of the large size, some cuts of meat may need to cook longer. Also, any large volume of food takes longer to reach the desired internal temperature, so I'm positive why they added this feature. As you go up to 8 quart models from Hamilton Beach, they tend to not have timers, so the 7-quart model is the last version where you can get this. There are other brands that do feature large capacity and digital timers, namely the Gourmia 8.5-quart [LINK]. To celebrate testing a large slow cooker like this one I decided to buy a roast. In the owners guide, it says you can cook up to a 4 pound roast. I bought a 3-pounder, and it seemed to be quite small compared to the size of the crock, even with onions and a few small veggies in there. 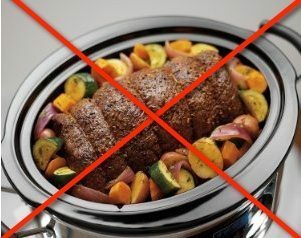 But keep in mind, you should never fill a slow cooker FULL. Examples shown on the sales page are ridiculously inaccurate as to what your final meal should look like. Still, I think I could fit a bigger roast than 4 pounds as recommended. I guess I'd just need to experiment with cuts of meat and cook times. This particular roast turned out a little dry, but otherwise delicious. It might have been the cook time, since I did leave it over night and it cooked for about 8 hours. It probably could have finished in just 6 hours. But I used my beer and tangy BBQ sauce recipe, so of course the meat turned out delicious. This is also how I make my ribs! There are a few basic ways to compare model 33473 to other slow cookers from Hamilton Beach and other brands. Below other variants of the 7 quart models, so I want to use this section to talk about programmable slow cookers of different sizes. You could also check out the Crock Pot programmable Cook and Carry 6-quart, or the Hamilton Beach Set ‘n Forget 6-quart. The cook and carry comes with those snap-clips for the side so you can safely transport your slow cooked meals without spilling anything. The Set ‘n Forget lineup from HB comes with a probe attachment so you can set a meal to cook until the internal temperate reaches a certain point. That would be perfect for cooking something like a roast or chicken, where you don't want to be constantly cutting into the meat to see if it's done yet! For a similarly programmed 7-quart slow cooker, you should also check out Crock Pot Smart Pot. That's a list of all their sizes. Scroll to the bottom of that page and you'll see the 7 quart one listed. The interface looks quite similar, and it also has 4, 6, 8, and 10 hour options. I actually featured Model 33473 in a list about 7+ quart mid-priced slow cookers, but it is much cheaper than its counterparts which can cost over eighty dollars! However, because it came with programmable features, I wanted to get it in a list somewhere, and there was already a manual version from Hamilton Beach in the inexpensive list. 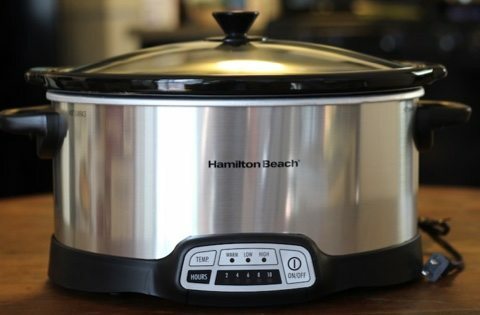 Who Is The Programmable 7-Quart Hamilton Beach Slow Cooker Best For? The 7-quart programmable slow cooker from Hamilton Beach is perfect for someone that needs to cook more than the average person. I'm talking large families, meal preppers, or someone that goes to a lot of pot lucks. This is a large appliance, so I wouldn't buy it “just in case” you need in one day. 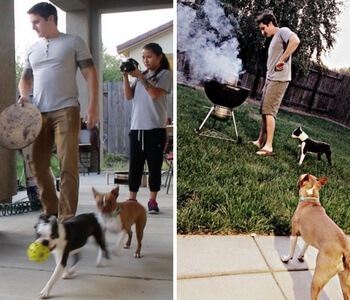 If you are an individual or a small family, try one of the smaller versions I linked above. It's also worth considering though that if you make stuff like slow cooked ribs with the bone in, they tend to stack in funny ways, so a larger cooker might do better. For example. A family of four, with two teens, could most definitely pack away 10-20 spare ribs after everyone is done with work or school for the day lol. The programming feature doesn't make much of a price difference, especially in the long run, so I wouldn't really consider the manual version [LINK] unless you have super long cook times. I'm very surprised that such a large slow cooker with the addition of the programmable timer is available for such a low price. Hamilton Beach is a reliable brand with a large variety of cookers but this is one of the best of the bunch. Rather than get confused by all the options and designs out there, stick with the basics. If you're in the market for a 7 quart slow cooker, this model is perfect for you. 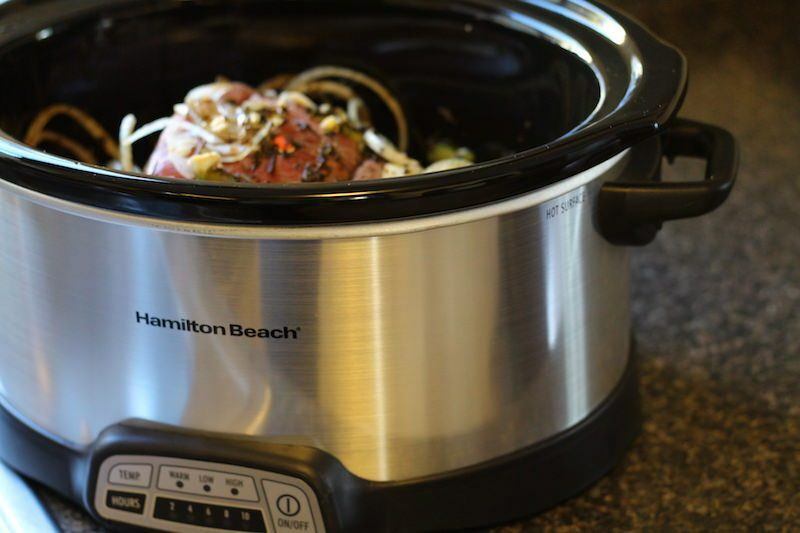 Get The Hamilton Beach 7-Quart Programmable Slow Cooker Here!